As important as actors and actresses are, the place setting is also very important in a movie or drama. Many producers show indefatigable zeal in choosing appropriate places, which is why the existence of location managers is important for movies. A lot of sites could qualify as settings, but universities are especially loved by many staff as there are many buildings to utilize, are easy to compose a story around, and it is easy to control the public entering the during vacations and weekends. While many producers are using universities in their works’ background, Keimyung University is often chosen to be the setting for movies. Keimyung University is so popular as it has one of the most beautiful campuses in Korea. As evidence of this, the Dongsan Library and College of Business Administration in Seongseo has won the grand prize in design competitions in 1986 and 1996, was selected as the top 10 most beautiful campuses by UNN (University News Network) in 2001, and KAC (Keimyung Adams College) building received the ‘2008 Daegu Architectural prize’. In recognition of this, many commercial managers, drama and movie producers want to shoot scenes on the campus, and moviegoers can often see the campus on movie screens and TV. One of the representative samples is Mr. Sunshine, a current much talked about drama with many popular dramatists, actors and actresses. Of particular significance is Keimyung’s Hanhakchon, Keimyung College’s Hanok village, which is used as the heroine’s house and an institute in the drama. This is just the latest example though, as the history of love for our campus from many people has been quite long. Wind in the Grass is a drama from 1993 and was the start of the use of KMU’s campus, while Sandglass, Ditto, Boys Over Flowers were among the most popular. After these were released, our campus became famous and has been represented about 100 times in mass media. Because some movies like Princess Deokhye, Operation Chromite, The Priests etc., which were shot at our university were box office hits, the rumor is abroad between producers and filmmakers that works which use Keimyung university become successful. Actually, Park Chan-wook, a movie director, said, “whatever is shot, everywhere is as pretty as a picture and can be a work” when he took a scene for a movie, Thirst at the Daemyung campus in Keimyung university. Kim Eun-sook who is famous for a dramatist of Guardian - if you are interested in K-drama, you might know the name - which was one of the most popular Korean dramas last year wrote a new script and shot scenes at Keimyung Hanhakchon as the heroine’s house and an institute. The Hanhakchon was made by modeling two Korean folk villages Hahoe (Andong) and Yangdong (Gyeongju). 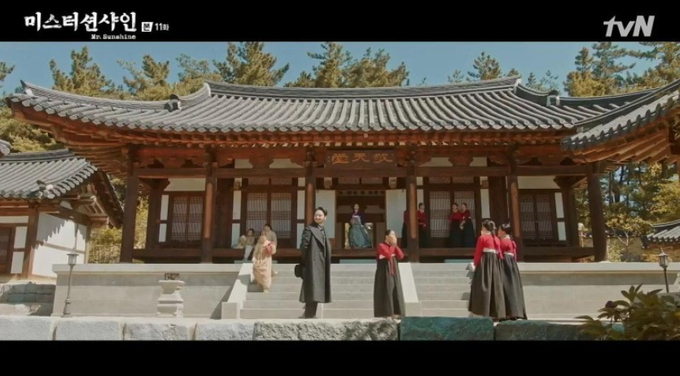 The production team of Mr. Sunshine thought Keimyung Hanhakchon could present a traditional Korean house style built in the Chosun Dynasty. Like this, Hanhakchon has been used for historical dramas. Further, as Daemyung campus, which was established in 1950s, has a more classical style, has been used for period dramas in the modern and present age like Sandglass, Ditto, Love Rain, Bridal Mask etc. Contrastingly, Seongseo Campus, with its wide and polished atmosphere looks modern and exotic, was used in Boys Over Flowers, East of Eden etc. For this reason, Keimyung University has been shown in lots of closing credits. -Every building in Keimyung University is made of red bricks, and ivy has crept along the walls and looks like Ivy League colleges. Actually, Keimyung was founded by American missionaries who wanted to educate outstanding students to lead the world at the time of the Korean War, so they constructed the buildings after the Ivy League colleges in America. Particularly, the main building is same as the main building of Harvard University, an Ivy League school. Due to the exoticness of the campuses, a lot of people have shown special interest in the school. -It had an impressive promotional effect. The university is still as fresh as Shinhwa High School in Boys Over Flowers in people’s memory not only for Koreans’ but also for foreigners. Many international students have learned about Keimyung University through K-dramas are applying to Keimyung. Takhmina Shukurova, an exchange student in the 2018 spring semester also chose KMU as her new university for her exchange student life because she is a fan of Boys Over Flowers. Of course, to get attention and promotional effects are important, but the most important thing is that it is an institute of learning for students. No matter how popular dramas and movies may be, if it might interrupt students studies, films can’t be shot at KMU. Most works are done during vacation time or weekends. In addition, the campus must not be used to shot suggestive scenes. If these conditions are followed, the university allows crews to use their facilities free of charge. The university is only popular for the staff and producers of film, but it has also become so popular that many people visit Keimyung University. The most popular area is the Metasequoia Road which became popular in East of Eden. It is popular as a cherry blossom street in spring, and a ginkgo street of in fall. Not only students but also the pubic often come to the university to see, enjoy and take pictures to keep the beauty. Above all, many couples visit the campus for beautiful wedding photos, so when you visit there in spring or fall, it will be easy to see couples preparing for their wedding. There might be many more examples of use of KMU campus as a background than you knew. There are too many works to share, but Keimyung has probably already caught you without you knowing it.